12 May Pilates, created BY a man… for MEN! I was somewhat surprised when I learned that Pilates was originally designed for men. It makes sense that a man would create a method that felt most true to his own anatomy and physiology. Even though he may have designed his method specifically on men for men, the work is so incredibly brilliant in the way that it speaks to any body regardless of gender. 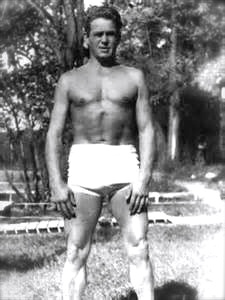 There is no question, Joe Pilates was a genius and way beyond his time. I believe he would be very happy to see that these days more and more men are giving Pilates a try… and loving it! Along with well known athletes such as; basketball star Jason Kidd, pitcher Curt Schilling and offensive lineman Ruben Brown, all men can benefit from a regular pilates routine. Hard working business men report less stress and better posture which results in less low back and neck tension. They are then left with more energy for the other, often neglected, part of their lives…. enjoying it! I highly recommend that if you are a man of any age/level of fitness and have ever considered trying Pilates… now is the time! Take advantage of our Summer Special Intro Package today! 5 Private Lessons for $450!! “There are three things, broadly, that I enjoy about Pilates. The first is the awareness one develops of ones own body, of where it is in space at any moment and of what muscles one is engaging to place it there. This, of course, is the product of ones interaction with an attentive instructor, who is observing when one is “cheating” and suggesting exactly what one must do to correct oneself. The second is the effect it has on ones muscle strength, flexibility and breathing. I find it is not just “the core” that benefits (although it does disproportionately, because one learns to engage it even as one is using other muscles). I came to Pilates after Yoga, and found it an order of magnitude more effective for me in each of the above two areas.